TTN: Hobart City Council have installed $200k in maps. 61 signposts dotted around the city give tourists instructions. Suspicious though is the Hobart Mayor’s insistence that the QR code ‘technology’ is worth 200k. A QR code is just a barcode that takes users to a different website. Say there were five QR codes on a sign, representing 5 different languages. It would be just as easy for a tourist to write ‘www.hobarttoday.com.au’ (in their language) and have the URL redirect to a version of Hobart City Council’s site that published up to date information in the language they’d searched in. The City of Hobart doesn’t even need to pay extra hosting on their server for an additional URL and a bunch of pages in each language. The codes appeal to marketers (at, for example, Hobart City Council) because if 1000 people were to be tracked using the QR codes then the marketer could prove these $200k signs were effective marketing spend. It’s much more likely, however, that the city’s marketing agency, or a consultant friend of the marketing team, has just earned themselves a quick $100k. If the city really thought it could justify the spend on $200k in visitor information signs, the onus is on Hobart City Council to prove in next year’s budget that more than, say, 2000 people used the QR codes. 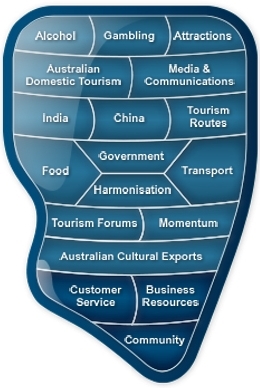 International tourists in Tasmania’s capital will only need a smartphone to translate visitor information into their own language as a new digital network is rolled out around Hobart. New digital stations called Wayfinders have been installed across Hobart to make it easier for people to find their way about the city. The three-metre tall signs, which have a distinctive orange band at the top, are part of a Hobart City Council trial. 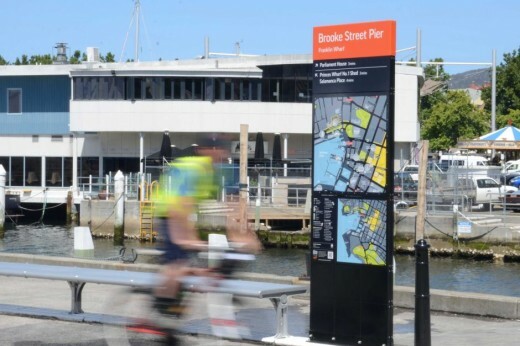 Two signs have already been installed on Hobart’s waterfront near the Brooke Street Pier and the council has asked for public feedback over the next few weeks. The plan is to eventually install 61 Wayfinders across the city, which is expected to cost ratepayers $200,000. Each sign contains essential information about Hobart’s CBD including landmarks, distance markers and retail precincts. They will also have a digital barcode, or QR code, which tourists can scan on their smartphones to learn about the latest attractions, such as this weekend’s Wooden Boat Festival. Hobart’s Lord Mayor Sue Hickey said she hoped it would make life easier for tourists, particularly those from overseas. “Eventually you’ll be able to scan your smartphone onto the QR system and you’ll be able to read the map in several different languages,” she said. As the program rolled out over the year, the council’s hoping to include more codes encompassing different languages and options for the visually impaired. “It will help local businesses by increasing pedestrian traffic and boost people’s health and well-being by encouraging more people to walk,” Alderman Hickey said.